Clive Ashdown. Image courtesy Sydney Mail. Clive Ashdown was born in Bega in 1893, where his father, Edward Parker Ashdown, was the manager of the Commercial Banking Company of Sydney. In April 1899 Edward was appointed manager of the Orange branch of the bank, a position that he held until his death in March 1909. 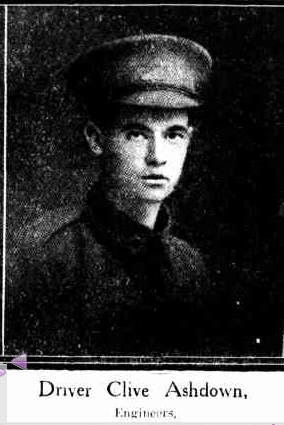 The eighth of nine children, Clive followed the example of three of his brothers and enlisted in WWI in December 1915. He embarked from Sydney just two weeks later, a driver with the 7th Field Company Engineers, 2nd Reinforcements. Driver Ashdown was hospitalised on several occasions during his service. In March 1916 he was admitted to the 3rd Auxiliary Hospital in Heliopolis with influenza. And in January 1918 he was accidently knocked down by a motor ambulance in Rouen, suffering contusions to his back and throat and necessitating his evacuation to Reading War Hospital in England. Clive was assigned nursing duties aboard the Carpentaria during his return to Australia. He was discharged from the AIF in November 1918. It appears that Clive, like his father, was employed by the Commercial Bank. In 1923 he was employed in the Leeton branch, and in November that year was acting manager of the Quirindi branch while the manager took leave. Later in life he was an officer with State of New South Wales Bank. Clive died at his home in Chatswood in May 1954. He was survived by his wife, Elsie Mary nee Murdoch. Clive Ashdown is commemorated on the Holy Trinity Church Orange Honour Roll, where his father had been a church warden. Three of Clive’s brothers and one of his sisters also served in WWI: Cecil Parker and Edmond Arthur were killed in action in France in July 1916 and April 1917 respectively, Ernest Ewen returned to Australia in March 1916; Staff Nurse Maud Ashdown was discharged from the Australian Army Nursing Service in March 1917. This entry was posted on March 14th, 2016.